Time for another review. Long overdue in fact. You'd think the shady but historically true Project MK-Ultra would make for a smashing political thriller, with its detestable CIA experiments of mind control via drugs and careful conditioning on the unsuspecting American population. Instead, Hollywood loosely appropriated it for a stoner comedy. And sadly, not the funniest imaginable. American Ultra fires more bullets than jokes. At least the lead casting is a shot in the right direction. Jesse Eisenberg and Kristen Stewart have worked together before and it shows, as they have the right amount of chemistry to make a likeable couple of losers. From Eisenberg, we've come to expect a certain level of quality, especially when it concerns this type of character. Stewart's performance thus leaves more of an impression, since we still needed some convincing of her talents as a true actress. With her much praised serious role in Camp X-Ray recently behind her, we can safely say 2015 is the year she finally came into her own and left her Twilight stigma behind her. Still, it takes more than two good leads to make for a solid movie. A decent plot and the right balance between action and comedy, for instance. American Ultra doesn't have either. Where the fun is concerned, the movie starts at least promising, and a few good laughs are to be had in the first act. However, the film increasingly opts for action over comedy, which makes for a rather dull and unfunny finale, where both the jokes and the necessary emotional investment in the main characters is lost in all the gun fights, knife fights, and fist fights. There's simply too much fighting as the movie progresses and most of it is excessively violent, but not in any ironic or tongue-in-cheek manner. It's just a bloody mess, as is the story, which also involves rival CIA agents fighting it out in a manner totally devoid of the intelligence the I in their agency is supposed to stand for. There's also room made for a few stereotype drug dealers and deranged super assassins, but none of it works on the levels the writers probably intended. Director Nima Nourizadeh, fresh off the allegedly culturally notable teen flick Project X, shows a little too clearly he has more affinity with destroying things and blowing stuff up than in making us care about it all. Fortunately we still have RED to show us how a fun time can be had with CIA assassins being hunted by their own employer. However, a definitive movie about Project MK-Ultra is still very much lacking. If Hollywood does tackle the touchy subject again, I hope they make a more serious movie out of it. 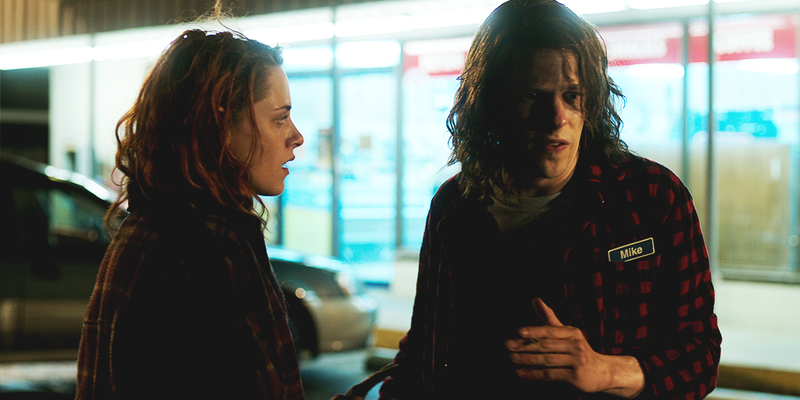 Mind control simply isn't funny, as American Ultra shows.